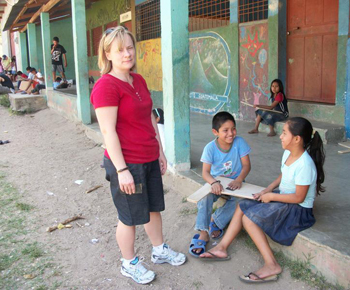 When Robyn Crumpacker was greeted in the Guatemalan village of El Triunfo, she expected a handshake. Instead, she got her stomach squeezed. The friendly gesture was one of many she received as five Indiana State University students traveled abroad for spring break. Venturing off to a third-world country proved to be relaxing for Crumpacker, a sophomore from Cloverdale, and fellow students Monica Block of Tell City, Stephen Johnson of Clay City, Janet Wall-Meyers of Terre Haute and Savannah Cox of Dugger, led by instructor Jennifer Todd. The trip was part of a Social Work 400 class that examined family and child welfare in a social work framework. El Triunfo, in southeast Guatemala, is a rural town whose name doesn't show up on a map, where the nicest floors are made of cement and cinder blocks in the ground are replacements for toilets. Between the stomach squeezes and showered kisses, the group gained insight to the family-oriented and simple lifestyle in which they were immersed. Each student lived with a different Guatemalan family in the village; most of them surrounded by children-in one case, 12. Yet even in the crowded homes of multiple children, families treated students as one of their own. "My mom wanted to comb my hair every morning," Block said, smiling at the memory. A sophomore language studies teaching major with a concentration in Spanish, Block was the only student in the group who was not in the social work field. 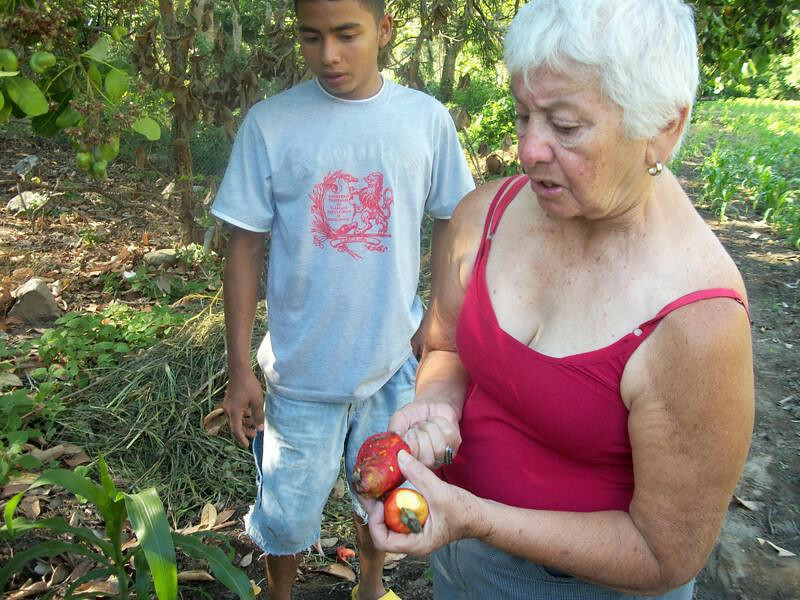 She journeyed with them in preparation for her future study abroad experience in Spain. Limited resources did not hinder the families' desire to spoil their American guests. "Everything was for me. If they thought I needed help bathing, they were right there to do that. I couldn't ask for food because it was already on the table," Crumpacker said. The group traveled in conjunction with "The Guatemalan Project," a nonprofit organization that works with the people of El Triunfo to build a sustainable community, an important effort for the country with 51 percent of the population in poverty and plagued with chronic malnutrition. Sustainability, Crumpacker said, is the key. While monetary contributions can aid a community temporarily, it's about discovering what resources are needed. "When the money goes away and when people from other countries go away, will they survive?" she questioned. Besides visiting the health clinic, preschool program, senior citizens center, a local farm, various neighborhoods and the U.S. Embassy, the group observed an elementary school throughout the week. Schooling is not a requirement for children in Guatemala, partially due to the lack of funding from the government. Because of this, teachers tend to be flexible with students in hopes that they will continue attending. "If a kid wants a sucker in the middle of the instruction, he gets up, goes across the street, buys a sucker and may come back, or may not come back," Crumpacker said. The group also visited San Carlos University, an advanced higher education institution that offers numerous degrees as well as an established social work department. Plans for an ongoing relationship between Indiana State and San Carlos University's social work departments are already underway. "During the visit, a meeting was completed to discuss the possibilities of working with this university and its students," Todd said. "Undergraduate student exchanges, further cross cultural experiences, and faculty opportunities both in Guatemala and at Indiana State University were addressed." While in Guatemala, the students also participated in two service projects, including collecting shoes for a local soccer team and resurfacing desks at the elementary school. The idea of further communication with the rural Guatemalan town excited Block, who "fell in love" with the people of El Triunfo and admired their relaxed and un-hurried lifestyle. "They do not know that they are dealing without the things we have in the United States. They are happy enough with their way of life and do not feel that they need all of the luxuries we have since they may not know they exist," she said, "We have so many responsibilities, and we are much too busy [in the United States] to just live simply and relax." Students looking for a global perspective found the week-long trip beneficial. Crumpacker, who is married with three children, said, "I know for a whole semester I couldn't leave my kids or my husband. [A week] is enough time to get away and actually experience it." The "study" portion of the trip, besides learning about Guatemalan culture, included daily journal entries, group discussions, paper submissions and prior reading. The students agreed that they should not pass up opportunities to study abroad. "What you read in books is from one person's perspective," Block said, "but whenever you go, you actually get your own perspective and get your own grasp on things, and I think that's very important. This experience cannot be replicated." Photos: http://isuphoto.smugmug.com/photos/1248258854_NgSgQ-L.jpg - Jennifer Todd, a social work instructor at Indiana State University, supervises two Guatemalan children during a spring break trip to the Central American nation. Dr. Cecilia Campoverde, who hosted Indiana State University faculty and students during a spring break trip to Guatemala, shows some of the food she grows on her farm. http://isuphoto.smugmug.com/photos/1248250590_e6vP7-L.jpg - Indiana State university students sit at classroom desks they resurfaced for a service project during a spring bring trip to El Triunfo, Guatemala. 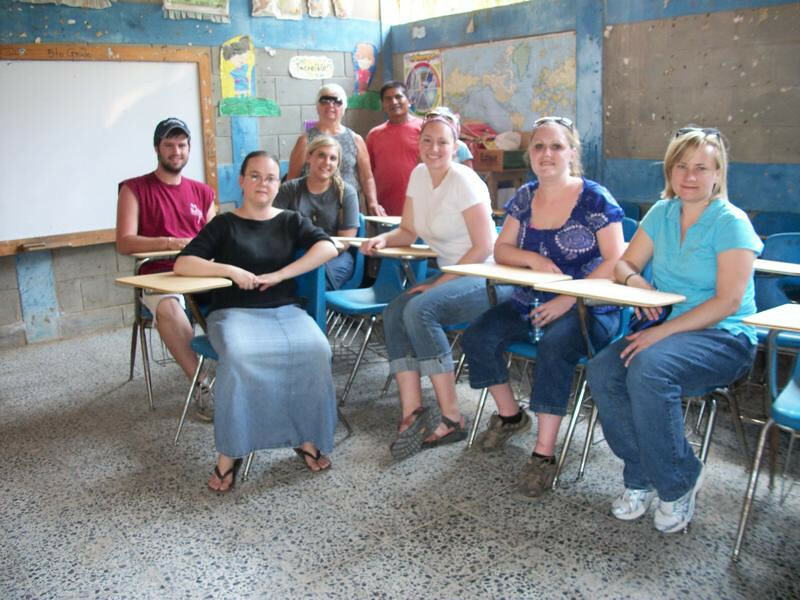 From left to right are students Stephen Johnson, Janet Wall-Myers, Savannah Cox and Robyn Crumpacker; instructor Jennifer Todd; Dr. Cecilia Campoverde, the group's host; and an El Triunfo resident.